Looks like a crash happened here, leaving scratches and an oily mark on the Hwy. 34 bike path. 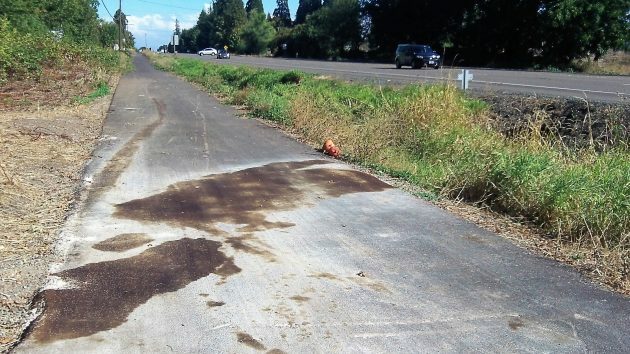 The million-dollar bike route on the north side of Highway 34 east of Corvallis is less than a year old, but it doesn’t look new any more. It could use a little attention on the maintenance front. So I got on my bike and took a look. My correspondent was right about the weeds and berry vines along portions of the new path, the 1.9-mile section of between Wolcott Road and Riverside Drive. An ODOT contractor completed that section of the path last November at a cost of roughly $1 million, part of a $3.38 million project at the Peoria Road intersection. The oily patches and gouges in the path’s pavement look like the results of a motor vehicle crash, and the oil has been sopped up as much as possible. As for the weeds, they don’t hamper traffic on the path yet. Left unchecked, they might eventually encroach too much. The thorny vines snaking their way cross the pavement in the 29000 block are a threat, not as much to people on foot as to the tires of bikes whose riders don’t see them in time to swerve. Maybe an ODOT maintenance crew could give the path a going-over once or twice a year. Or this might be a project for volunteers organized under ODOT’s “Adopt a Highway” program. There’s a fair amount of paperwork involved with the latter, though. 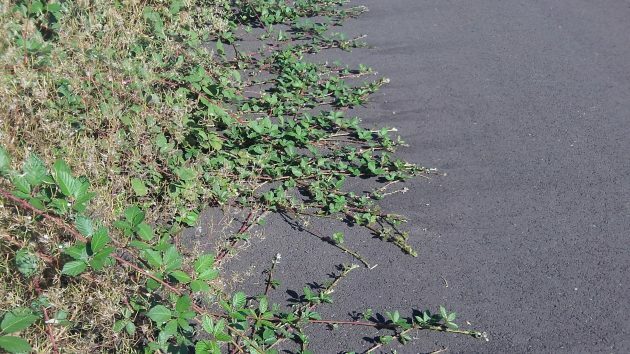 Before tackling invasive species (presumably including blackberries), highway adopters are supposed to write a plan and get approval from the Department of Agriculture. But if they grow much farther, these vines will threaten tires. I am a great admirer of Mr. Hering, having followed his journalistic high jinks for several years. During that lengthy period, which includes Hering’s post with the Democrat-Herald as well as his current effort, Mr. Hering consistently bashed and berated government action. With one glaring exception. Whenever Mr. Hering focused his rapier wit on issues having to do with bicycling, he suddenly turns into a big-government fanboy, asking for more of everything having to do with with his favorite fetish. More bike paths, more bike lanes, more legislation to protect bikers, fewer restrictions on bicyclists, and so on. When Hering’s much-maligned liberals call for government actions on issues other than bicycles, Mr. Hering is a junkyard dog, attacking government action as little better that socialism designed to strip Americans of their private property rights and other horrors. But, when it comes to all things bicycle, Mr. Hering becomes a bleeding heart liberal doppelgänger. This dichotomy leads one to suspect that Mr. Hering’s professed allegiance to conservative principles is purely a convenience forHeeing. In short, his professed core principles are flexible, bending like a knee pushing down on the bike pedal. Inactivity and obesity, leading to metabolic syndrome, type 2 diabetes, heart disease, etc, will cost the country in the range of $1 trillion per year and cause vast misery and premature death. Much of that money will be spent by government via existing entitlements. I don’t think conservatives want to collect or borrow that much money, but I could be wrong. Part of a good solution is getting people out of cars and on bicycles, as a major lifestyle shift, not just a weekend activity. Sounds like someone that has to complain about something. Enjoy your misery, because I do. We all play faves to our personal likes! A challenge to HH … more like a suggestion … thread that needle in our divided culture. Find a common cause …some would call a common denominator. Fine. That cause would be something local, on that beat, to bring unlike minds together. Division is damning. We need something to take down the masks and work together towards. Sure! …some would fall away and stew in bitterness. Time does not care. Ideas all? Impressive crossroad we find ourselves entering. Quote from your story: “The blackberries are growing across the path making tripping on them a legal hazard.” This is exactly the problem today. People want, want, want, then want absolutely no responsibility for themselves. Just ridiculous. Exactly why everything is so expensive and getting worse all the time. This must be the same person we are trying to protect by removing all the trees from North Albany park. Get off the couch & venture out to the park where you will see that not “all” the trees have been removed. 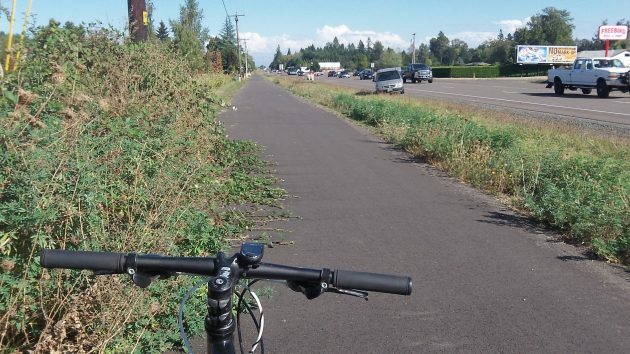 As for the bike trail … step up LINN COUNTY!